A few weeks ago we presented a wine from the southern part of the Chilean vineyard. Here is one from the Valle de Elquí, located in the very north, at the edge of the Atacama desert (one of the world’s driest places). This used to be pisco land (Chile shares both this sour grape liqueur and the desert with its neighbour Peru). 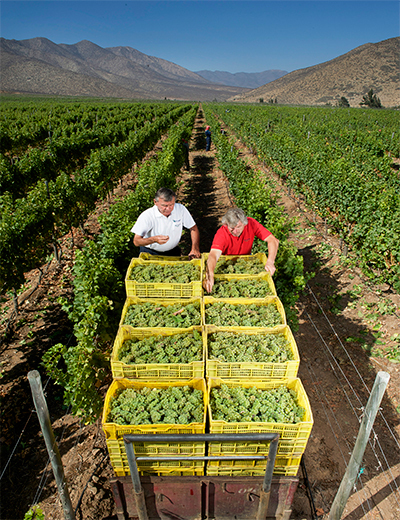 Nowadays Elquí is noted for fresh and fragrant wines, from sauvignon blanc, syrah and other grapes. Elqui means ‘narrow valley’ in the local quechua language, and it’s still a place with herds of vicuña, a relative of the more famous llama. (Believe me, I have seen them myself!) As expected, the valley is hot and dry, and irrigation is essencial. Host to a number of astronomical observatories, this province is famous for the bright light, the pure air and the clear sky. In fact the number of sunlight hours is higher than anywhere in Europe. But the vineyards go up to 2.000 meters above sea level, and the nights are cool, so the growth cycle can be slow, and it’s still possible to achieve a degree of acidity in the wines. While closer to the Pacific coast at lower altitudes, the soils have more clay and silt, the soils up here are rocky with chalky components. There was almost no vinegrowing in Elquí before the 1990’s, when the trade began to seek alternatives to the areas around Santiago. Aldo Olivier Gramola (a native from Trentino, Italy) was one of the people who realized the potential. When Aldo met his cousin, oenologist Giorgio Flessati, Chile’s most northernly winery Viña Falernia was established in 1998. The grapes for the Sauvignon Blanc was handpicked, the vinification was carried out in steel tanks and stayed on the lees for 6 months. A small percentage of the must was aged 4 months in oak casks. Light yellow with hints of green. Aroma of white flowers, mature berries, aromatic herbs and fennel (maybe from the oak treatment). Mellow in the mouth, with a decent acidity, good concentration and lenght. This delightful Atlantic wine from the Galician DO Ribeiro we had at Málaga’s Los Patios de Beatas wine bar and restaurant tonight. Ricardo Carreiro of Gomariz was one of the pioneers of modern day Ribeiro when he started to recover indigenous grape varieties and helped to set up various projects. Ricardo jr took over in 2000 and hired oenologist Xosé Lois Sebio, and the winery has since then become one of the leading lights of the region. Both reds and whites are made in their 28 hectares estate, some farmed biodynamically. Contrary to popular belief the red wines are common in the area. Many are blends that contain the sousón, a variety with good structure and compatible with oak treatment. The Flower and the Bee is some kind of a side project that we have commented on before. Apart from this, Abadía de Gomariz can be regarded as an entry level red. It’s a blend of sousón (50%), brancellao, ferrol and mencía. The vines are trained in espalderas. The soils here in the Avia valley are schist, sand and clay. The must was pre-fermented at cold temperatures, and the alcoholic fermentation was done in steel tanks with frecuent pumping-over. The wine stayed in used 300L barrels, mostly French, for a year. Deep brilliant purple. Aroma of dark berries (black cherries), herbs and some spicy and balsamic notes (eucalyptus). Fleshy in the mouth, luscious but still with some bitterness in the end. The tannins are rounded off with some time in the glass. Food: Light meat, lamb, white fish, squid (Pulpo a la Gallega)… With its fruit and freshness it’s a very versatile wine. At Los Patios we had it with blackened cod with sesame seeds and Oriental spices.